There is only one guaranteed way to get fired from the Department of Veterans Affairs. Falsifying records won't do it. Prescribing obsolete drugs won't do it. Cutting all manner of corners on health and safety is, at worst, going to get you a reprimand. No, the only sure-fire way to get canned at the VA is to report any of these matters to authorities who might do something about it. That, at least, is what the U.S. Office of Special Counsel recently reported to the president of the United States. The Special Counsel's office is the agency to which government whistleblowers go to report wrongdoing. "Our concern is really about the pattern that we're seeing, where whistleblowers who disclose wrongdoing are facing trumped-up punishment, but the employees who put veterans' health at risk are going unpunished," Special Counsel Carolyn Lerner recently told National Public Radio. Now, obviously, this shouldn't happen. Everyone, except perhaps the managers at the VA, probably agrees with that. So by all means, let's have some reforms and further protections for whistleblowers. But that's not a real solution. The real fix is to get rid of the VA entirely. The United States has an absolute obligation to do right by veterans. It does not have an absolute obligation to run a lousy, wasteful, unaccountable, corrupt and inefficient bureaucracy out of Washington. Of all those adjectives, the one that gets to the core of the problem is "unaccountable." Elected officials are supposed to be held responsible for the actions of the government, right? 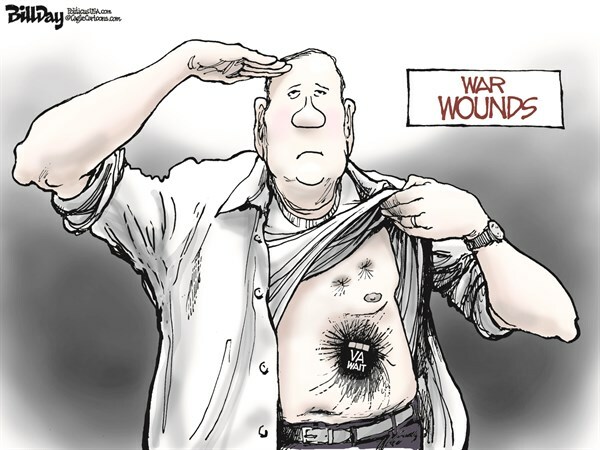 Well, which politician should we fire for the endless stream of outrageous VA scandals of the last few years? The president? Leave aside the fact that he won't be on the ballot in 2016; not a lot of voters put reforming the VA bureaucracy at the top of their list of priorities. Is there a congressman or senator who might lose an election because of the VA scandals? If there is, I can't figure out who it might be. Every representative and senator has raced to the cameras to express their outrage, and not one is accepting a scintilla of responsibility for the problem. But they are all responsible because they have simply ceded authority to the bureaucrats themselves. There is a reason the Founding Fathers put most governmental functions at the state and local level. It's because a large nation cannot be run from the center. Imagine that the federal government simply gave all of the VA hospitals to the states they're in. Instead of the VA budget, Congress just cut checks to states to spend on their veterans. You'd still have problems, of course. But what you would also have are local elected officials -- city councilmen, state legislators, mayors, governors, etc. -- whom voters could hold directly accountable. Moreover, these officials would be more likely to understand the nature of the problems faced by their constituents. As a result, you would see states handling similar problems in different ways. Some techniques would be better, some would be worse, and some would just be different. Arizona is simply different than Vermont, so it may handle things differently. Still, this process would allow everyone to learn from both mistakes and successes in a way that a centralized bureaucracy cannot or will not. Personally, I'd rather see the money spent on veterans go straight to the veterans themselves, in the form of cash payments or vouchers to be used for health care in the private sector. But my point really isn't to figure out the best way to provide for veterans; it's to highlight the best way to organize a free society. One of the chief reasons so many people are angry at Washington right now is that government has become detached from democratic accountability. Obamacare really isn't a piece of health-care legislation, it's a huge permission slip for bureaucrats to design a system as they see fit. The same goes for large swaths of the federal government. Congress doesn't make many decisions about environmental regulations; the EPA does. Moreover, the EPA makes decisions that no Congress would ever approve if the decisions were left to the elected officials. Congress likes it that way, because the politicians would rather complain about bad decisions than take responsibility for tough ones. That's not how America is supposed to work. We elect politicians to make decisions. If they make bad ones, we get to fire them come Election Day. The growth of the federal bureaucracy is really a protection racket. It insulates both the bureaucrats and elected officials from the voters they're supposed to work for.